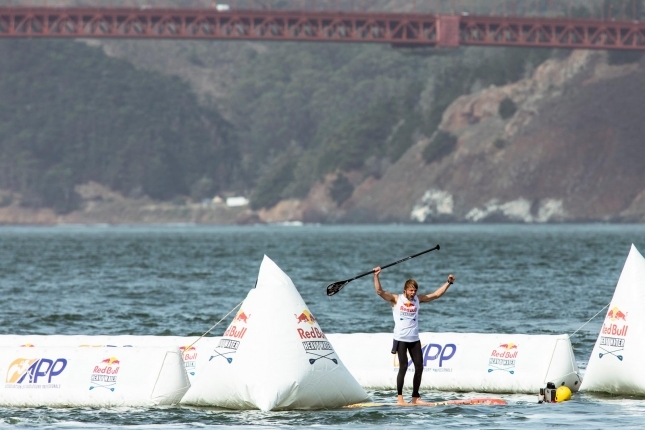 That’s how Casper Steinfath described today’s Red Bull Heavy Water race to me shortly after he crossed the line in San Francisco to claim victory in what is surely the craziest SUP race ever witnessed. 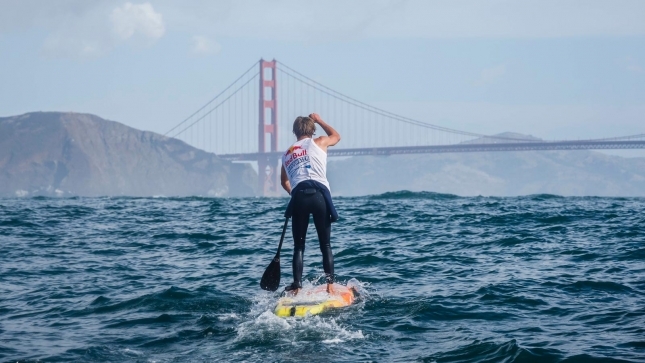 Casper picked up a record $20,000 prize money by beating home a small but all-star field of paddlers, many of whom didn’t even finish after the event lived up to its name and delivered arguably the biggest waves ever seen in a SUP race. 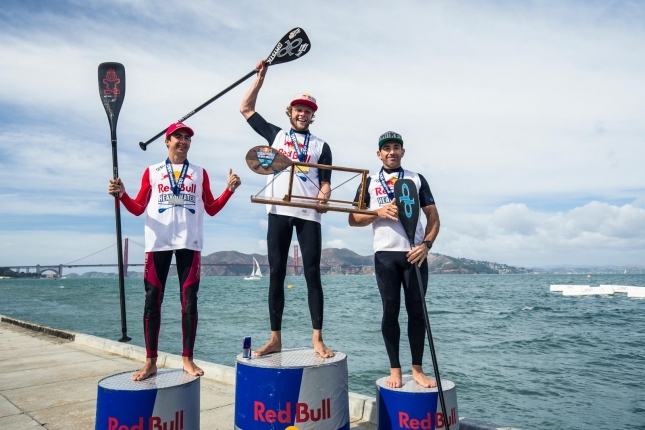 The Red Bull athlete gave the title sponsor a big win by out-maneuvering his rivals in the wild waves before holding his lead all the way to the finish line inside San Fran Bay. 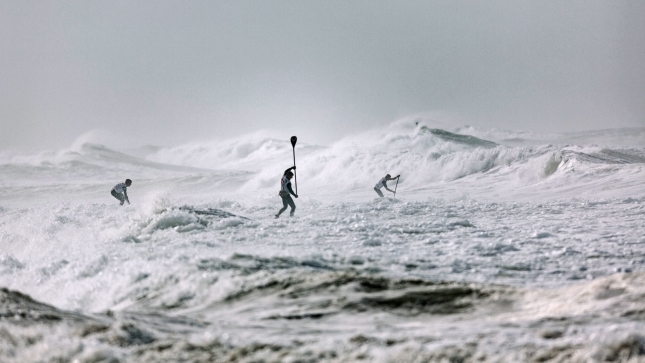 The result cements Casper’s status as the true “Viking” of SUP. Rising prospect Ryan Funk was also supremely impressive, paddling well beyond his years to finish runner-up ahead of some of the biggest names in the sport, while veteran Aussie Travis Grant finished third despite only arriving in San Fran a few hours before the race after taking a near-sleepless red-eye flight from Hawaii. Ryan was actually sitting in third at the Golden Gate Bridge but over-ran Travis in the closing stages, which is not something many paddlers can ever claim to have done. The Red Bull Heavy Water course saw paddlers start outside the break at Ocean Beach – one of the heaviest waves in California – and follow a giant “W” shaped course that forced them in and out through the surf twice before heading off on a near hour long mini-marathon, which sent them up the coast and beneath the iconic Golden Gate Bridge to finish just inside the relatively placid San Francisco Bay. Kody Kerbox outshone his more famous Maui comrades to claim a strong fourth place, while Michael Booth survived what was probably the heaviest wipeout of the race to claim fifth place after overpowering the fast-starting Slater Trout in the dying stages of the 7.5 mile course. 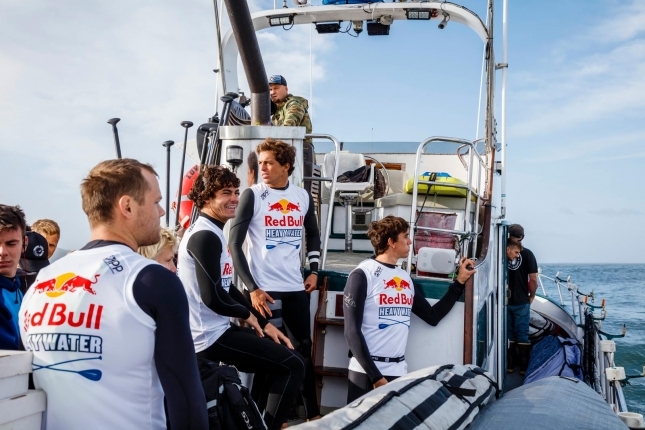 France’s Arthur Arutkin finished 7th but still picked up $1,000, with the $50,000 total prize purse on offer from Red Bull and the lead organisers, the APP, providing some solid pay-days for the boys (see the money breakdown in the results below). To highlight just how difficult the conditions were, last year’s Heavy Water runner-up and champion, Kai Lenny and Connor Baxter, finished 8th and 9th respectively, while another very fast paddler that’s no stranger to big waves, Mo Freitas, only just finished inside the top 10 after getting held up in the surf. 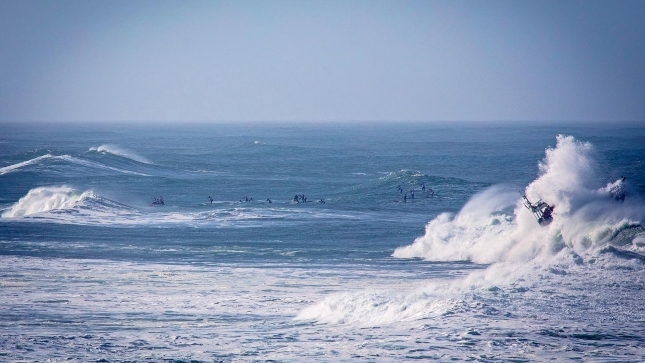 A quarter of the field didn’t even finish, while a couple of the guys opted to not even start after they woke up and saw the macking swells rolling through. The Viking told me the biggest sets were “probably pushing 15ft,” the Maui boys called it “solid 8ft” (8ft “Hawaiian” is about 12ft on the standard scale) while Ryan Funk suggested 10-15ft. Or in other words: BIG. The conditions were so intense that luck became a serious factor in the results, with several guys enjoying good starts before getting caught in the wrong spot and paying a heavy price on the time sheet. That included Michael Booth, who was in a virtual podium position when a massive set took him out. I’ve also seen footage of Kai paddling in the same spot for about five minutes as wave after wave pins him down, while Connor and Mo suffered similar fates. 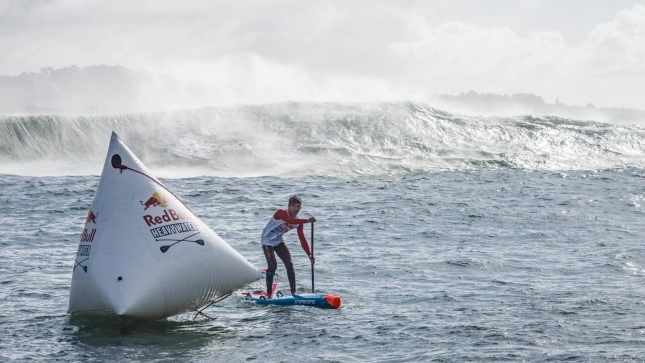 Unfortunately we didn’t get to watch the craziness live as there was no official webcast (SUP the Mag ran an unofficial Facebook Live stream but conditions made it impossible to get very close to the action), but one thing’s for sure: Red Bull Heavy Water certainly lived up to its name.